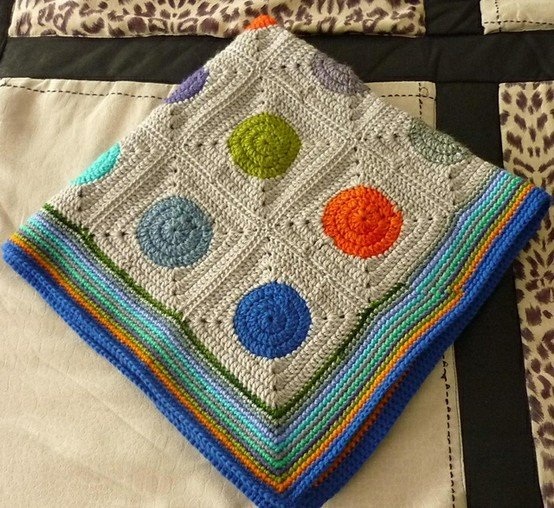 Just found a great video tutorial for the circles to granny square blanket I plan to make for myself. Now if I could just decide my colors. So far I am thinking of making it very similar to the inspiration blanket ( I still can't remember who's blog I saw that on), just not using the orange and purple. Making it to match the throw pillows a little more. I haven't has a ton of time to crochet, as you can see we are working on tooth #2. But I did sneak in some time to get a few row in on the bobble blanket. When all of he sudden I was out a yarn..... So now the bobble blanket is at a stand still again because I made the cardinal crochet sin. I didn't buy enough charcoal skeins for the whole project. When I went to pick some more up they were all sold out!!!! I will have to go again later this week to see if they are re stocked. Is it just me that does that?